When I moved to St. Louis several years ago, there were lots of neighborhoods to choose from and lots of factors I could look at but a few stood out. I didn’t want to have a long commute and I like a city that is diverse. The diversity of UCity (University City) stood out for me. So I should have seen the year of the monkey coming. 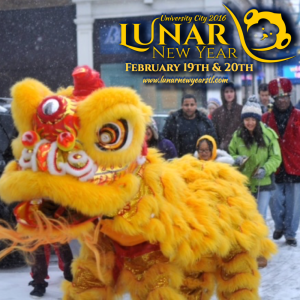 I was invited to a meet up with some of the organizers of the University City 2016 Lunar New Year celebration, I had to check it out. And I am glad I did! There were awesome cocktails at the LuLu bar too! So nice of them to serve up some yummy food & drink for those of us attending the preview. AND I met some awesome folks who live and/or work in UCity and found out there is a good bit planned to celebrate the upcoming lunar new year (lots of us call it Chinese New Year but there are other cultures that celebrate it too). I met folks whose families come from a variety of countries in Asia — Julia Li of Create Space (who invited me), Al Li of the Asian American Chamber of Commerce and Shayn Prapaislip of United Provisions. Last year was the first time they put together a celebration but this year they are taking it up several notches by getting the city and a lot of local businesses involved. This year there will be several ways to join in the festival — including a brew tasting Friday, Feb 12, banquets Friday, Feb 19 and a full day of entertainment, food and local artisans Saturday, Feb 20. You can get all the details at Lunar New Year STL. According to the Chinese horoscope, we are entering the year of the monkey. Combine that with Urban Chestnut being a sponsor of the festival (in addition to Create Space and the UCity Chamber of Commerce), and it is no surprise that a beer for the event is coming! Special and holiday brews are pretty common for craft breweries but Shayn says he has looked around and can’t find any other beers that were specifically down for lunar new year. This weekend will see the debut of the Moon Monkey Ale with Ginger. If you are interested in being among the first to try it or any of several other beers, catch the lunar brew tasting on Friday, February 12 in Create Space. Saturday, February 20th brings a day of performances, food & artisans starting with blessings on the businesses on the Delmar Loop, a parade, night market and performance and concluding with a Moon Monkey After-Party. 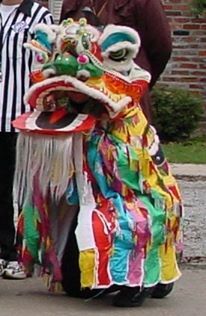 Among the performances will be a lion dance, Chinese fan dance and drums. Since there is so much going on, be sure to check the full schedule. If you want to see more of what St. Louis offers, check out my St. Louis A to Z series of posts!